An organization’s performance depends on the performance of its employees and the employees’ performance show vast improvement if the work is carried out by them in a workplace which is safe and has a healthy environment. Safe and healthy workplaces are always the most efficient. In fact the two go hand in hand. Also, a bad accident due to the lack of safety and healthy environment at the workplace can bring a serious damage to the organization. Safety and health at the workplace is part of the organizational management, just like production and quality. Safety and health affects production, quality, and the financial results. So it is required to be managed in the same way as other aspects such as product development, distribution, marketing, sales targets or any other management issue in the organization. It is important that management plans for it, invests in it, manages it and regulates it. In short, safety and health at workplace is an intrinsic part of the organizational management. Safety and health at the workplace is essential for preventing injury and illness to the employees at the workplace. Therefore, it is about protecting the organization’s most valuable asset which is its workers. By making available safe and healthy working environment at the workplace, the organization reduces the lost work hours and hence the cost which is associated with it. It also eliminates the interruption to the operations with resultant increase in productivity and quality. A safe and healthy workplace raises employees’ morale and thus is one of the keys to organizational success. Safe and healthy workplaces have more satisfied and productive employees (i) who produce higher quality products or/and services, (ii) return to work more quickly after an injury or illness, and (iii) feel loyal to the organization. Safe and healthy workplaces are better places to work. Such places help in retaining of employees and establishing positive community relations. Safety and health management at the workplace is a straightforward part of the organizational management. It involves practical steps that protect employees from harm and at the same time protect the future success of the organization. There are statutory requirements for the safety and health at workplace that the management is to meet, but accidents also cost money and time – employees off work, material costs and damage to buildings, plant or product. For running a successful organization, management needs to manage the quality of the product or service, and the productivity. This is possible only by managing the safety and health of the employees. The way this is being done in the organization is determined by the organizational management system. Safety and health at workplace is a right and responsibility both for the employees and the management. The employees have a right to a safe and healthy workplace and must be involved in keeping it that way. The most important thing the management can do for the safety and health at workplace is to believe as well as make the employees believe that the safe and healthy workplace leads efficient production and higher productivity. Successfully managing safety and health in the workplace relies on commitment, consultation and co-operation. Everyone in the workplace needs to understand the need for safety and health, what their role is in making the workplace safer, and how they can fulfill their responsibilities and duties. Effective consultation between management and employees on safety and health can make a real difference to workplace safety and health management. Change for the better is not difficult to achieve when management and employees work together and co-operate to find solutions to problems. Setting up a hazard management program — to identify workplace hazards, to assess the risks those hazards pose to the safety and health of the employees in the workplace, and to introduce measures to control those risks — is the basis for a planned, systematic approach to making sure workplaces are better places for performing of their tasks by the employees. Consultation about safety and health, and developing policies and procedures which are backed up by information and regular training normally have a real effect on reducing and preventing injuries at work. 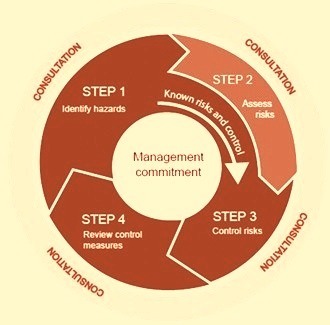 Management of safety and health at the workplace involves the following four steps for control of the risks (Fig 1). Identifying of the hazards – It is finding out what can cause harm to the safety and health at the workplace. A hazard is anything that could be harmful to any person. Some hazards are obvious because they are quite common to the industry, but others can by more difficult to identify. Working closely with the employees and looking at every task at the workplace assist in finding potential hazards. Assessing of the risks – It is the understanding of the nature of the harm that can be caused to an employee exposed to the hazard and the likelihood of its happening. A risk assessment can help determine (i) how severe the risks are, (ii) whether any existing control measures are effective, (iii) the actions which need to be taken to control the risks, and (iv) how urgently the action needs to be taken. A risk assessment does not have to be complex. Controlling of the risks – It is the implementation of the effective control measures which are reasonably practicable in the circumstances. The most efficient way of controlling risks is to eliminate a hazard, so far as is reasonably practicable. If not reasonably practicable the next step is to minimize the risks so far as is reasonably practicable, (i) by substituting (wholly or partly) the hazard creating the risk with something that creates a lesser risk, (ii) by isolating the hazard from the employee exposed to it, and (iii) by implementing engineering controls. If a risk still remains, the remaining risk must be minimized , so far as is reasonably practicable, by implementing administrative controls such as a method of work, a process or a procedure designed to minimize risk, or the use of personal protective equipment (PPE). A combination of controls should be used if a single control is not sufficient for the purpose. Reviewing of the control measures – Reviewing is essential to ensure that the control measures are working as planned. Controlling safety and health risks in the workplace is to be an ongoing process that needs to take into account changes in the workplace. This is why procedures and risk controls must be reviewed regularly to ensure they remain effective. There are several measures which assist organizational management to keep the workplace safe and healthy. Important measures are given below. Maintenance of the equipment- Workplace equipments are to be well maintained. Working with defective and unhealthy equipments can cause accident which can be severe. Hence it is to be ensured that all the maintenance procedures are followed to keep the equipments healthy. Further the equipment designer normally incorporates a large number of safety features in the equipments while designing it. It is to be ensured that these safety features are not tampered with during equipment maintenance. Housekeeping -To some employees, housekeeping means cleaning of floors and surfaces, removing dust, and organizing clutter. But in a work setting, it means much more. Housekeeping is crucial to safe workplaces. It can help prevent injuries and improve productivity and morale. Every employee has to play a role in housekeeping by keeping his own workspace clean. Housekeeping is to be an ongoing process, not a one-time practice. In addition, housekeeping should have management’s commitment so workers realize its importance. Disciplined working – Discipline is an aspect of behaviour. It involves in using of sound methods with consistency. Disciplined working is needed most whenever human error can cause harm, substantial inconvenience or expense. Disciplined way of working is designed to reduce / eliminate human errors, prevent common mistakes and improve consistency in the work. Disciplined working also improves efficiency, saves time and even facilitates creativity. It results into the safe working of the equipments and processes. It requires adherence to a strict operating discipline. The discipline needs to be formulated along with the safety precautions, during design and then enforced during operation. Working with systems and procedures – Working with system and procedures makes the workplace safe and healthy. Systematic working with laid down procedures removes adhoc working and hence reduces chances of the workplace accidents. Training and development – Providing the correct training allows employees to do their jobs properly and safely. Induction, site and task specific training must be given to the employees when they first start work and at a minimum it must cover (i) specific workplace safety responsibilities, (ii) reporting of a hazard or other safety issue, (iii) safe work procedures for the job, and (iv) make available the information which help them in doing their job safely (e.g. operator’s manual etc.). Supervision – It is needed to ensure safety and health in the workplace. The level of supervision required depends on the age and experience of the employee and the hazards associated with their tasks. Young and inexperienced employees in general need a higher level of supervision. Consultation – Management which consults with their employees gains a better idea of the hazards that are present in the workplace. Consultation with the employees helps in making proper decisions that affect the safety and health in the workplace. Also consulting with employees on safety and health issues demonstrates the commitment of the management with respect to safety and health in the workplace and this encourages the employees to communicate the workplace safety and health issues with the management. Risk management – Management needs to assess the risk to safety and health in the workplace by (i) by identifying the hazards in the workplace, (ii) assessing the hazards risk to safety and health, (iii) eliminating or controlling the risk, and (iv) monitoring and reviewing the control measures to ensure on-going safety. The matters related to workplace safety and health normally falls under three categories namely (i) matters involving the employees, (ii) matters involving the system, and (iii) matters involving system–employee sequential interrelationships. Matters involving the employees are mainly due to the employees’ attitudes and behaviours and are the most important reasons for the unsafe acts, accidents, injuries, and other outcomes at the workplace. The employees who have the worst attitudes are the most likely to have workplace accidents. However, the tendency to engage in at-risk behaviours in work settings can be reduced through training and behavioral reinforcement. The matters involving system are due to the technical system factors. These factors are the primary determinants of workplace accidents. The workplace unsafe practices very frequently have their true roots in system design. In these cases, many of the unsafe acts ranging from quality errors to major disasters at the workplace can be traced to system design and process management. Hence in these cases there is a need for correction in the system and design. In the case of the matters involving to system – employee sequential interrelationships, the role of organizational climate (a social system variable) and the technical attributes of the system (safety hazards) are important since they influence human behaviour. The messages, symbols, and values communicated within the organization can influence employees to take safety shortcuts. Furthermore, the role that the employee plays in reacting to the technical system potentially set off a series of ping pong like effects between the employee and the local environment. Controls for workplace safety and health management falls into three categories in order of priority. They are (i) engineering controls, (ii) administrative controls, and (iii) personal protective equipment controls. Engineering controls are applied to the layout and/or equipment design so that the workplace becomes safer for the employees to work. Administrative controls are training of the employees, making and implementing of working procedures, carrying out of the hazard analysis, or risk analysis etc. and providing of adequate supervision and so on so that employees work safely at the workplace. Personal protective equipment controls are those controls which ensure that the employees uses proper personal protective equipment when they work at the hazardous workplace. For safety and health at the workplace, continuous improvement involves seeking better ways to work, measuring performance and reporting against set targets. It is also about (i) systematically evaluating compliance with procedures, standards and regulations, (ii) understanding the causes of incidents and injuries, and (iii) openly acknowledging and promptly correcting any deficiencies.